I often feel like the New York Times article “What Is It About 20-Somethings?” personified, the question mark perpetually superimposed over everything I see and touch, like those index cards my high school Spanish teacher stuck on every object in her room, identifying their Spanish names. “La television” and “el escritorio.” Except there’s no clear answer this time. I get to fill in the blank. Impressively and patiently, my parents take it all in stride. Some days, I inundate my dad’s inbox with new plans of jobs and internships, of English-teaching opportunities, of I-want-to-be-Samantha-Brown aspirations. “What do you want to do [with your life] today?” is one of his common greetings. What I want is an opportunity that will foster, rather than contain, my enthusiasm, cause a snowball effect where I stumble over my words and letters and phrases with the wanting, the craving to get them out fast enough so I can hurry up and do more and see more and say more and have my life be an endless run-on sentence instead of a question mark or, even worse, a period. Yes, that’s what I want. Lots and lots of doing with only the most promising of punctuation. I made this soup when the weather was cold. (By my definition–we’re talking 50 degrees or so.) Now, the weather is warm. Miraculously, this soup is well-suited for both occasions, hearty with its bean backbone and springy with its fresh basil freckles. This recipe is from The Italian Momma of pizza and pesto fame. It won’t be the last you see of her, not by a long shot. 1) In a large pot (I used my Dutch oven), saute garlic in oil and butter for about two minutes on medium-low heat. 3) Add tomatoes and juice, reduce heat to simmer for a few more minutes. Stir in spinach, beans and basil, and simmer for another minute. Add salt and pepper to taste. Serve with grated cheese. 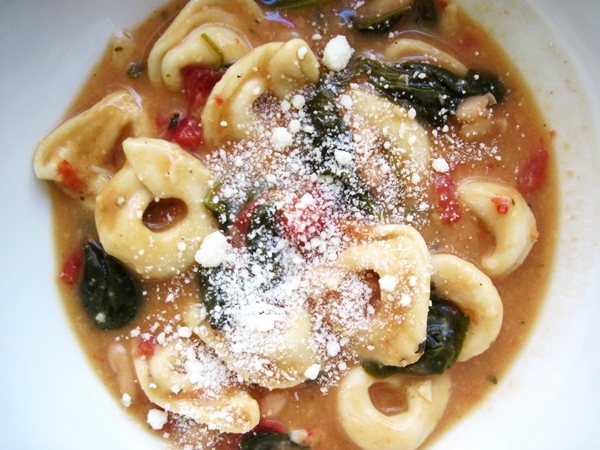 This entry was posted in Italian, soup and tagged basil, beans, cannellini, spinach, tomato, tortellini. Bookmark the permalink. Why did you have to post this when I have 3 major papers to finish in the next couple of weeks? Now all I want to do is cook this! Because I’m plotting against you. MUAHAHAHA. I like how quick this recipe is! Tortellini soup, what a concept. Tortellini means Sunday brunch at Charlies in Charlotte as a child. 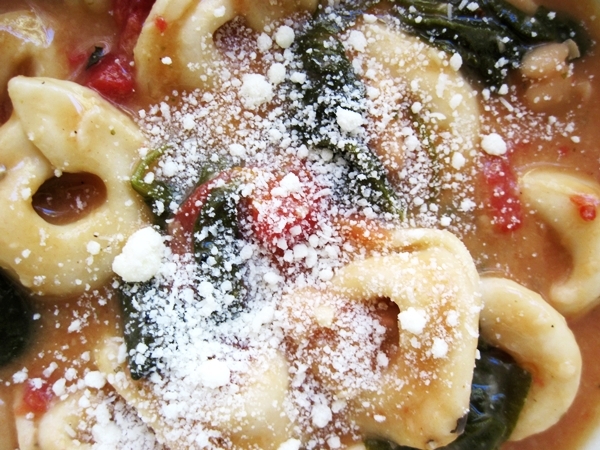 I wanted to be a big kid and order off of the adult menu, and the green, tomato red and beige tortellini circles were the perfect pick for 8 year old me.. Now to find a gluten-free noodle and make this soon, maybe when the weather is ‘cold’ again. This. sounds. fantastic. Hope this one makes it onto the Monitor blog. When are you coming to Boston to cook for meeee? I hope so, too! Wondering if they’d be willing to publish the neurotic ramblings of an almost-college-grad. Times change, but things stay the same. You could have copied and pasted most of that on my blog, had one (or even PCs) existed 32 years ago. My goals on graduating from the j-school were 1) not to go home to my parents 2) be the next Woodward & Bernstein combined. One of those was accomplished. And I’ve decided pie tastes better than scandal.